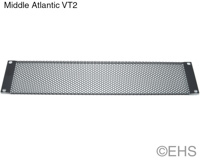 Middle Atlantic's VT Series vent panel. Steel panel with top and bottom flange for strength, 63% open area, smooth black powder coat finish. Because we are an active installer and depending on our current stock/ project extras, we may ship the "contractor pack" version, it is the exact same panel with simpler packing (only a bag and simple label).